I won’t lie the cover and the book seem totally cheesy but I love Egyptian pharaohs and ancient gods, so I figured why not? 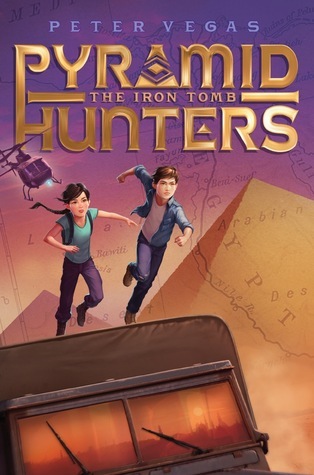 When Sam Force goes to Egypt to spend the summer with his Uncle Jasper, he expects it to be the usual vacation filled with boring museums and boring lessons about the pharaohs and ancient gods. Instead, Sam arrives at the airport only to find out that his uncle is missing and wanted by the police. After narrowly escaping his own arrest, Sam sets off to find his uncle using the series of clues his uncle has left behind. Can Sam uncover the truth, clear his uncle’s name and find his uncle alive before it is too late??? I’m totally stunned that this was decent. It was fast paced and entertaining. The historical information was solid. It was informative without being boring and there was just enough information without being overpowering and turning a read off. Vegas does an interesting job with setting up the series at the end of the book rather than in the beginning and it totally works for this reader. The characters as well as the story are believable and entertaining. My inner 14 year old boy really enjoyed this and I would most definitely pick up book 2 even though it won’t be set in Egypt. Iron Tomb (Pyramid Hunters #1) by Peter Vegas comes out tomorrow, August 2, 2016. If you are looking for a solid middle grade level book check this out. This entry was posted in Middle Grade and tagged Iron Tomb, middle grade, Pyramid Hunters #1 Peter Vegas. Bookmark the permalink.